How to find the Nth Largest Numbers from a List of values in Excel ? How to show or hide Vertical & Horizontal Scroll bar in Microsoft Excel 2016 ? How to find the Nth Smallest Number from a List of values in Excel ? There are times when you might want to find out the 3rd Largest value from the list of number from Excel cells. How to find the N Largest Numbers from a List of values in Excel ? Microsoft Excel provides the function LARGE which lets you to this. The function LARGE takes 2 parameters. – The first parameter takes the range of cells. – The second parameter specifies the nth Largest value that you are searching for. 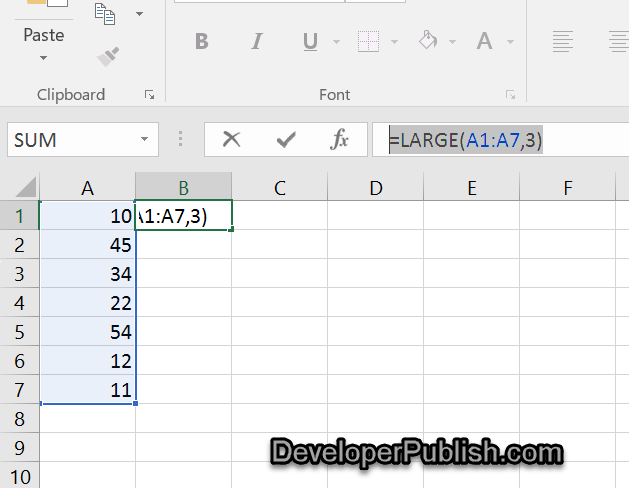 Assume that the Excel Column (A1:A7) contains the range of values , you would need to find the 3rd Largest value from this range and display it in the cell B1. Just enter the following formula in the cell B1.